AUL NOW UNDERSTOOD why he had been so often warned of danger in Jerusalem. He knew his life was not safe among his own people, the Jews. No doubt he felt sad, because he loved the Jews and longed to have them catch a glimpse of the great love of God, which reaches down to all men. On Paul's second night in the castle, while he was sleeping the Lord appeared to him and said, "Be of good courage, Paul; for just as you have spoken boldly for me in Jerusalem, you shall speak boldly for me in Rome." This encouraged paul greatly, for he had long desired to visit Rome, the capital city of the Roman Empire, and preach the gospel there also. The enemies of Paul were not content to have him imprisoned; they desire to kill him. Forty of them met together and purposed to eat nothing until they had killed him. Then they hurried to tell the chief priests and other Jewish rulers about their purpose. "You can help us," they said, "by asking the chief captain to send Paul down tomorrow so that the rulers may hear his case again. And while the soldiers are bringing him from the castle, we will rush upon them, seize Paul, and kill him." Paul's nephew heard about this wicked plan and he hurried at once to the castle to tell his uncle what the Jews were planning to do. Paul quickly called a centurion, a captain of one hundred men, and asked him to take his nephew to the chief captain. "The lad has something important to tell him," said Paul, so the centurion brought the young man to see the chief captain at once. 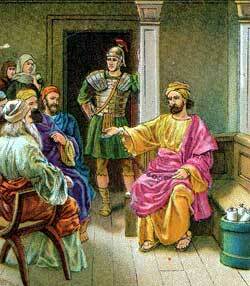 The chief captain felt interested in Paul because he knew this prisoner was a Roman Jew. He knew also that the Jews in Jerusalem despised Paul for no just reason; and when he heard the young man tell about the plot of the Jews against Paul's life, he said, "Do not let any one know you have told this to me." With these words he sent the young man away. Calling two centurions to him at once, the chief captain told them to prepare to take Paul that night to Caesarea. And to make sure of Paul's safety, he commanded them to take hundred soldiers with them, and seventy men on horseback, and two hundred spearmen. Paul, too, should be given a horse to ride on. At nine o'clock that night the sound of horses' hoofs clattered on the pavement before the castle door. Then Paul was brought out and placed on one of the horses, and the small army began to move rapidly down the dark street. None of the Jews knew about the errand of this company of soldiers, and they did not guess until too late what might be happening to the man whom they wished to kill. On the next afternoon Paul was brought safely to the Roman governor, Felix, and the chief captain's letter was also delivered. This is what Lysias, the chief captain, had written concerning Paul: "This man, who is a Roman, was taken by the Jews and would have been killed by them had I not come with my army and rescued him. When I sought to know the reason why they accused him I brought him before the council of the Jews; but I found that they had no charge worthy of death or even of imprisonment to bring against him. Then it was told me how they were plotting to take his life, therefore I have sent him to you. And hoofs have given commandment to his accusers that they come before you to his trial." Felix, the Governor, asked Paul to what Roman province, or country, he belonged, and he learned that Paul's home was in Tarsus of Cilicia. Then he placed him in the palace which used to belong to Herod, to wait there until his trial. When this lawyer had finished making his complaints against Paul, the Governor motioned for Paul to rise and defend himself. Then Paul said, "These men can not prove anything this lawyer has spoken against me. Only twelve days ago I went up to Jerusalem to worship God; and they did not find me stirring up the people, but they seized me when I was alone in the temple. Those men who accused me then should have come now with their charges, if they have anything against me, for after the manner which they condemn so I worship the God of my fathers, believing all things that are written in the law of Moses and in the books of the prophets. And I have always tried to keep my heart free from wrong toward my God and toward all men." Felix then spoke. He said he would wait until Lysias, the chief captain, should also come from Jerusalem, and with those words he dismissed the council. He then gave Paul to a centurion, saying, "Let this man have his liberty, and do not forbid any of his friends from coming to visit him in the palace." Several days later Felix called for Paul again. This time Felix' wife, Drusilla, who was a Jewess, was with him, and wished to hear this prisoner tell about the gospel of Christ. Paul talked earnestly to these two, and while he talked Felix trembled because of his great sins. He knew he was guilty before God, and he became afraid. But he did not wish to humble his proud heart, so he sent Paul away, saying, "Some other day I will call again for you." Two years passed by, and during this time Paul was kept in Caesarea as a prisoner. He was given many privileges, and often Felix called for him, hoping that Paul's friends might notice the interest he took in Paul and offer him money to set Paul free. He knew Paul did not deserve to be kept a prisoner, still he refused to let him go.